Lucas Ordonez, Nissan's first Gran Turismo Academy winner, received what he thought was his best birthday present this week when he was selected to join the test team for the Nissan DeltaWing. The Nissan DeltaWing project aims to change the face of racing by completing the legendary Le Mans 24 Hours on June 16th and 17th, using half the fuel and half the tires of normal race cars. The design and principles used could change the face of racing. Ordonez, who turned 27 on Tuesday, will join Nissan DeltaWing driver Marino “Dario” Franchitti at Magny-Cours in France and Motorland Aragon in Spain. Franchitti is a successful driver and in IndyCar and it must feel great for Ordonez to be able to drive with him. The Gran Turismo Academy is an innovative competition created by Nissan and Sony that seeks to discover raw driving talent via the Playstation gaming platform. Lucas was the first winner of GT Academy in 2008 and the first student of Nissan's driver development program. He has seen successful with progression through the racing ranks and in just three years he has gone from virtual racing to reality, lining up for his first Le Mans 24 Hours last summer in LMP2. Earlier this year several GT Academy winners secured a podium finish at the 24 Hours of Dubai and one raced against legendary motorcycle racer Valentino Rossi. The fourth GT Academy competition began this week. Anyone in the world with a PlayStation3 with an internet connection and Gran Turismo 5 racing game can enter. Having taken a podium finish last year, Ordonez will race at La Sarthe again this summer, with the class-winning LMP2 prototype squad, Greaves Motorsport, alongside ex-F1 driver, Martin Brundle and his son, Alex. "It was very emotional to be asked by Nissan Europe to test such an important project. I am delighted that they believe in me to help with the work on this prototype car.” commented Ordonez. “To be involved in the development of an innovative car like this is another big step in the career of a racing driver." "The GT Academy is a major innovation in motorsport, designed to make the elitist sport of motor racing genuinely accessible to ordinary people, who don't have access to huge budgets.” said Darren Cox, General Manager of Nissan in Europe. The Nissan DeltaWing team comprises a group of key partners, comprising designer Ben Bowlby, American racing entrepreneur Don Panoz, Dan Gurney's All-American Racers organization and Duncan Dayton's Highcroft Racing team. This group now faces a race against time to make the car race-worthy in time for the world's most grueling and well known 24-hour race, Le Mans 24 Hours. The remainder of its testing schedule will take the Nissan DeltaWing engineering team to race circuits across Europe, before joining its fellow Le Mans 24 Hours entrants at the official ACO pre-Le Mans test on June 3 of this year. 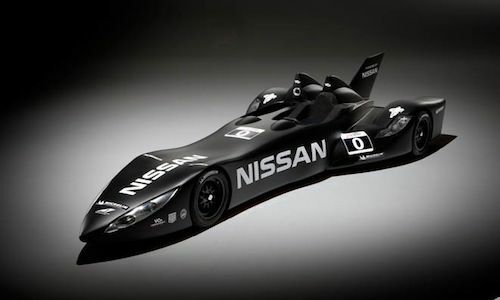 Nissan will be releasing videos about the DeltaWing project on YouTube as the team gets ready for Le Mans.